Here is the list of possible hybrid big cats (and some other smaller felines). Tawny, golden and white forms. 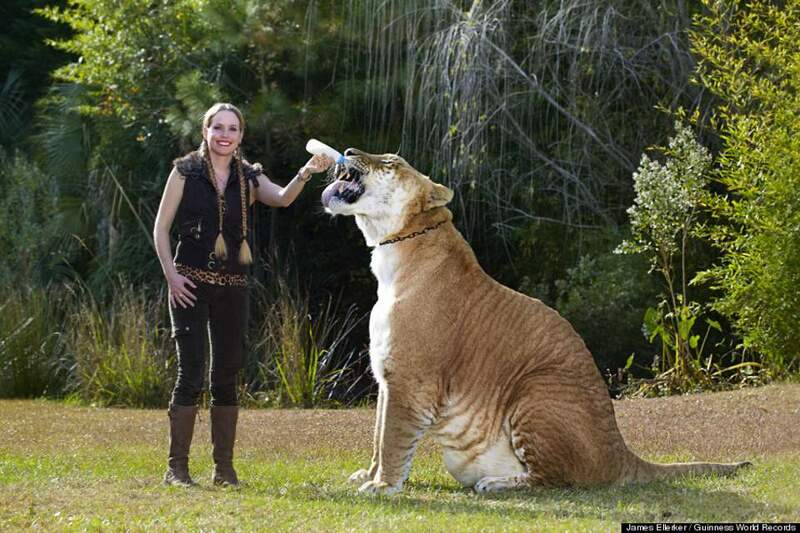 Ligers are the largest of all known extant felines. Ligers enjoy swimming, which is a characteristic of tigers, and are very sociable like lions. Ligers (and tigons) exist only in captivity because the habitats of the parental species do not overlap in the wild. Historically, when the Asiatic Lion was prolific, the territories of lions and tigers did overlap and there are legends of ligers existing in the wild. A tigon is a hybrid cross between a male tiger (Panthera tigris) and a female lion (Panthera leo). Thus, it has parents with the same genus but of different species. The tigon is not currently as common as the converse hybrid, the liger.The tigon’s genome includes genetic components of both parents. Tigons can exhibit visible characteristics from both parents: they can have both spots from the mother (lions carry genes for spots—lion cubs are spotted and some adults retain faint markings) and stripes from the father. Any mane that a male tigon may have will appear shorter and less noticeable than a lion’s mane and is closer in type to the ruff of a male tiger. It is a common misconception that tigons are smaller than lions or tigers. They do not exceed the size of their parent species because they inherit growth-inhibitory genes from the lioness mother, but they do not exhibit any kind of dwarfism or miniaturization; they often weigh around 180 kilograms (400 lb). Tawny, golden and white forms. A tigon is often smaller than either a lion or tiger though some have attained or exceeded the size of the smaller parent. America’s first liliger cubs born in the GW Zoo. Chicago, America. Spots and rosettes. Chicago, America. Later exhibited as the Congolese Spotted Lion. According to a report in a 1978 edition of the British tabloid paper “Sun”, a “pantig” (panther-tiger hybrid) was born at Southam Zoo, a private zoo located on Warwickshire farm (Southam is between Royal Leamington Spa and Daventry). The purported pantig was the result of a mating between a male black leopard and a tigress and was fostered by a Dachshund. The cub’s background colour was the typical yellow-brown shade of normal leopards. Unlike earlier attempts at captive-breeding leopard-tiger hybrids, this purported hybrid evidently survived into adulthood. Eventually, the Southam Zoo pantig was sold to an American zoo. Although this account is currently not scientifically authenticated, it indicates that the leopard’s recessive melanism gene is also recessive to the tiger’s normal tawny color. In the late 1890s/early 1900s, two hybrids were born in Chicago, USA, followed 2 years later by three sets of twin cubs born at a zoo in Hamburg, Germany from a puma father and leopard mother. 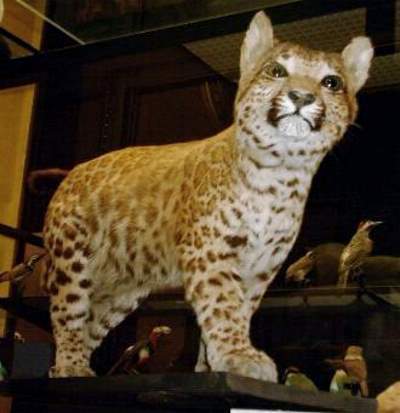 Carl Hagenbeck apparently bred several litters of puma x leopard hybrids in 1898 at the suggestion of a menagerie owner in Britain; this was possibly Lord Rothschild (as one of the hybrids is preserved in his museum) who may have heard of the two hybrid cubs bred in Chicago in 1896 and suggested Hagenbeck reproduced the pairing. The head of the animal is similar to that of a lion, while the rest of the body carries similarities to leopards. Leopons are very rare, but there are a few in Japanese zoos and also bred in Italy. Leopard x lioness seems more likely pairing. Liard hybrid is unconfirmed. Would be similar to Leopon. No precise parent details for caraval. Los Angeles, America. Accidental one-off; were sold as pets.